Tulipani është një lule në gjininë Tulipa, comprising about 150 bulbous species, and in the family Liliaceae. The native range of the species includes southern Europa, north Afrika, and Asia from Anatolia and Irani in the west to northeast of China. The centre of diversity of the genus is in the Pamir and Hindu Kush mountains and the steppes of Kazakhstan. A number of species and many hybrid kultivars are grown in gardens, used as pot plants or as fresh cut flowers. Most cultivars of tulip are derived from Tulipa gesneriana. The species are perennials from bulbs, the tunicate bulbs often produced on the ends of stolons and covered with hairless to variously hairy papery coverings. The species include short low-growing plants to tall upright plants, growing from 10 to 70 centimeters (4–27 in) tall. They can even grow in the cold and snowy winter. Plants typically have 2 to 6 leaves, with some species having up to 12 leaves. The cauline foliage is strap-shaped, waxy-coated, usually light to medium green and alternately arranged. The blades are somewhat fleshy and linear to oblong in shape. The large flowers are produced on scapes or subscapose stems normally lacking bracts. The stems have no leaves to a few leaves, with large species having some leaves and smaller species have none. Typically species have one flower per stem but a few species have up to four flowers. The colourful and attractive cup shaped flowers typically have three petals and three sepals, which are most often termed tepals because they are nearly identical. The six petaloid tepals are often marked near the bases with darker markings. The flowers have six basifixed, distinct stamens with filaments shorter than the tepals and the stigmas are districtly 3-lobed. The ovaries are superior with three chambers. The 3 angled fruits are leathery textured capsules, ellipsoid to subglobose in shape, containing numerous flat disc-shaped seeds in two rows per locule. Tulips originate from mountainous areas with temperate climates and need a period of cool dormancy. They do best in climates with long cool springs and early summers, but they are often grown as spring blooming annual plantings in warmer areas of the world. The bulbs are typically planted in late summer and fall, normally from 10 to 20 cm (4 to 8 in.) deep, depending of the type planted, in well draining soils. In parts of the world that do not have long cool springs and early summers, the bulbs are often planted up to 12 inches deep; this provides some protection from the heat of summer and tends to force the plants to regenerate one large bulb each year instead of many smaller non blooming ones. This can extend the usefulness of the plants in warmer areas a few years but not stave off the degradation in bulb size and eventual death of the plants. Tulips can be propagated through offsets, seeds or micropropagation. Offsets and Tissue Culture methods are means of asexual propagation, they are used to produce genetic clones of the parent plant which maintains cultivar integrity. Seed raised plants show greater variation, and seeds are most often used to propagate species and subspecies or are used for the creation of new hybrids. Many tulip species can cross pollinate with each other; when wild tulip populations overlap with other species or subspecies, they often hybridize and produce populations of mixed plants. Most tulip cultivars are complex hybrids and sterile; those plants that produce seeds produce offspring very dissimilar to the parents. In horticulture, tulips are divided up into fifteen groups mostly based on flower morphology and plant size. Single early group - with cup-shaped single flowers, no larger than 8cm across (3 inches). They bloom early to mid season. Growing 15 to 45cm tall. Double early group - with fully double flowers, bowl shaped to 8cm across. Plants typically grow from 30-40cm tall. Triumph group - single, cup shaped flowers up to 6cm wide. Plants grow 35-60cm tall and bloom mid to late season. Darwin hybrid group - single flowers are ovoid in shape and up to 8cm wide. Plants grow 50-70cm tall and bloom mid to late season. This group should not be confused with older Darwin tulips - which belong in the Single Late Group below. Single late group - cup or goblet-shaded flowers up to 8cm wide, some plants produce multi-flowering stems. Plants grow 45-75cm tall and bloom late season. Botrytis tulipae is a major fungal disease affecting tulips, causing cell death leading to rotten plants. Other pathogens include Anthracnose, bacterial soft rot, blight caused by Sclerotium rolfsii, bulb nematodes, other rots including blue molds, black molds and mushy rot. Historically variegated varieties admired during the Dutch tulipomania gained their delicately feathered patterns from an infection with Tulip Breaking potyvirus, the mosaic virus that was carried by the green peach aphids, Myzus persicae. Persicae were common in European gardens of the seventeenth century. While the virus produces fantastically colourful flowers, it also caused weakened plants that died slowly. Today the virus is almost eradicated from tulip growers' fields. Those Tulips affected by mosaic virus are called "Broken tulips"; they will occasionally revert to a plain or solid colouring, but still remain infected with the virus. Some historical cultivars have had a striped, "feathered", "flamed", or variegated flower. While some modern varieties also display multicoloured patterns, this results from a natural change in the upper and lower layers of pigment in the tulip flower. The Black Tulip is the title of a historical romance by Alexandre Dumas, père (1850), in which the city of Haarlem has a reward for the first grower who can produce a truly black tulip. A pink tulip of the Triumph cultivar - shown here in the color "Burns"
In 1559, an account by Conrad Gessner described tulips flowering in Augsburg, Bavaria in the garden of Councillor Herwart. Due to the nature of the tulip's growing cycle, the bulbs are generally removed from the ground in June and they must be replanted by September to endure the winter. Busbecq's account of the supposed first sighting of tulips by a European is likely spurious. While possible, it is doubtful that Busbecq could successfully have had the tulip bulbs removed, shipped and replanted between his first sighting of them in March 1558 and Gessner's description the following year. Another oft-quoted account of the origin of tupis is the one of Lopo Vaz de Sampayo, governor of the Portuguese possessions in India. When he returned to Portugal in disgrace after usurping his position from the rightful governor, Sampayo supposedly took tulip bulbs with him from Sri Lanka. This tale too, however, does not hold up to scrutiny because tulips do not occur in Sri Lanka and the island itself is far from the route Sampayo's ships should have taken. Regardless of how the flower originally arrived in Europe, its popularity soared quickly. Charles de L'Ecluse (Clusius) is largely responsible for the spread of tulip bulbs in the final years of the sixteenth century. He was the author of the first major work on tulips, completed in 1592. Clusius had already begun to note and remark upon the variations in colour that made the tulip so admired and his admiration of them quickly spread to others. While occupying a chair in the medical faculty of the University of Leiden, Clusius planted both a teaching garden and his own private plot with tulip bulbs. In 1596 and 1598, Clusius suffered thefts from his garden, with over a hundred bulbs stolen in a single raid. Between 1634 and 1637, the early enthusiasm for the new flowers triggered a speculative frenzy now known as the tulip mania and tulip bulbs were then considered a form of currency. The Netherlands are still associated with tulips and the term 'Dutch tulips' is often used for the cultivated forms. Tulip Festivals are held in the Netherlands, Spalding (England) and in North America every May, including the Skagit Valley Festival (Washington), the Tulip Festival in May in Orange City and Pella, Iowa, and the three week annual Canadian Tulip Festival in Ottawa, Canada. Tulips are now also popular in Australia and several festivals are held during September and October in the Southern Hemisphere's spring. The world's largest permanent display of tulips, although open to the public only seasonally, is in Keukenhof in the Netherlands. ^ Brickell, Christopher, and Judith D. Zuk. 1997. The American Horticultural Society A-Z encyclopedia of garden plants. New York, N.Y.: DK Pub. ISBN 0-7894-1943-2 page 1028. ^ Westcott, Cynthia, and R. Kenneth Horst. 1979. Westcott's Plant disease handbook. New York: Van Nostrand Reinhold. ISBN 0-442-23543-7 page 709. ^ Pavord, Anna. 1999. The Tulip. Bloomsbury Publishing Plc. ISBN 1-58234-013-7 page 31. 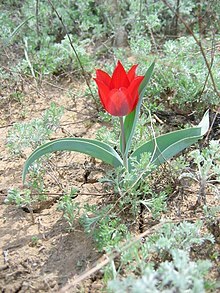 Wikimedia Commons ka materiale multimediale në lidhje me: Tulip. Kjo faqe është redaktuar për herë te fundit më 4 gusht 2018, në orën 08:41.